For the past few years, players have asked me, "What is Maurice Ashley up to?" Having been faced with this question countless times, I have created a script which essentially assures them that he busy working on chess projects. In my own selfishness, I too have wished for the Jamaican-born and Brooklyn-bred Grandmaster to grace the tournament halls and compete with the best. He has clearly taken on a new role as an ambassador for chess promotion, but assures me, "I still have a few mates left in me." In May, Ashley organized the richest open tournament in the history of chess with the HB Global Chess Challenge, but at the same time, he was hard at work on another important project. This month, the Doubleday Publishing Group released "Chess for Success," an interesting treatise on how chess benefits the youth. However, this is not a hum-drum book filled with opening principles, bad chess clichés, or a naïve romanticism of chess. One may notice that the foreword of Ashley's book was written by Will Smith, the famous movie megastar and chess enthusiast. Smith recounted how he was taught chess at age seven by his father and took another seven years of beatings before he would win his first game. He developed a passion for the game and this led to a meeting with the famed Grandmaster. As a surprise gift to Smith, his wife Jada Pinkett (also a movie star) brought in Ashley for a chess lesson. "It takes a special wife and an insane husband to play chess on Valentine's Day," quipped Smith. "Now whenever I have a break on the set of my latest movie, I find time to rumble with one of my various chess buddies. Whether it's Jamie Foxx or Barry Bonds, the trash-talking is always fierce. Chess has that special ability to exercise the mind while also being entertaining and exciting." It is not often that one finds a chess book as practical as "Chess for Success." You will not learn the intricacies of the Benko Gambit, nor will you be able to review any games of chess greats. However, you will develop an appreciation for how chess is able to provide so many benefits for those who are held captivated under its powerful spell. This book is part-autobiographical, part scholarship, part testimonial, part instructional. It is organized in an easy-to-read format (with short chapters) and reveals a side of Ashley that we have not seen despite the hundreds of articles and television programs that he has been subject of. Ashley recounts his early days in Jamaica including the fateful day of leaving his guardian grandmother to reunite with his mother in New York. Reminiscent of the Eddie Murphy movie, "Coming to America," he envisioned American streets being paved with gold. He even made a bet with older brother Devon that they would live in a tall skyscraper with a pool on the roof. Perhaps young Ashley had watched one too many episodes of "The Jeffersons." When he arrived in America, the first glimpse of the fantasy world he envisioned would be Brooklyn, New York… certainly not the place of skyscrapers, mansions and rolling gardens he had envisioned. As a young boy with an appetite for pranks and boyhood mischief, Ashley's innocence was lost amid scenes of shootouts, robberies and drug-dealing. There had to be a better means of "entertainment". One day he stumbled upon a chess book at the school library and begin to pour through the book as if it held the answer to a life-long question. He had found the fantasy he was looking for! As Ashley delved deeper into the "rabbit hole," he eventually gravitated toward the real world of chess… Brooklyn's Prospect Park. As the door of boredom and mischief closed, the door of opportunity and enthusiasm opened. This would become the stage upon which Ashley would learn lessons of life from "Black Bear" chess mentors. 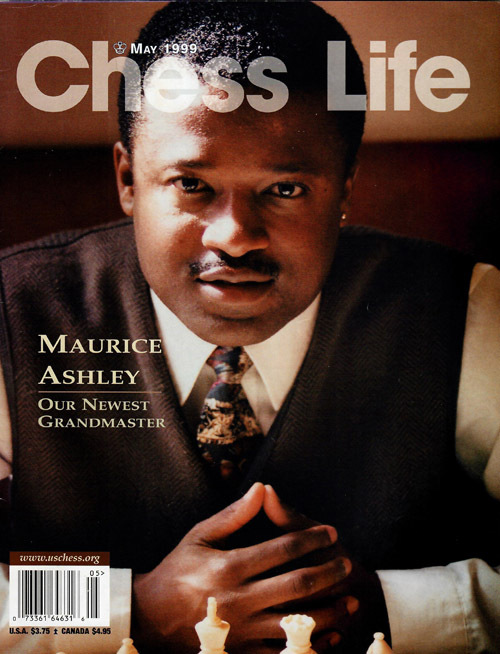 This is not a rags-to-riches story about how Ashley became a Grandmaster, but his chapter, "Chess Impacts My Life," is a lesson in itself. How did chess captivate Ashley and others like him? His book delves into a number of past studies providing evidence that chess had an impact in developing the social skills and learning capacity of children. These studies have served as a foundation to current initiatives (three of which he highlights later). If one questions the currency of the studies, the next chapter may be of greater interest. Ashley introduces the "flow concept" of Mihaly Csikszentmihalyi, the 40 Developmental Assets and Bloom's Taxonomy. Unlike some dry explanation of academic theories, Ashley demonstrated how chess brings the theories to life. In explaining these concepts, he uses many entertaining examples in his trademark style… clear, down-to-earth and memorable. In my opinion, this is one of the most important sections of the book as it relates to whether there is an identifiable connection between chess and education! It is almost impossible for a child to play a game of chess (well or poorly) without carrying out every mental operation listed on the chart. One of the most interesting parts of the book was Ashley's stories as a coach. His story sounds like most coaches… long on hours, short on resources… low on pay, high on passion. However, Ashley found a method that would generate enough enthusiasm… keeping them involved! With this method, he was able to garner support for the chess program, go on to coach three championship teams and win national acclaim for his success. "Being a part of the Raging Rooks chess team was like being a part of a family, a sense of camaraderie, students who share the same passion. By studying with you, I knew I was good. You instilled a lot of confidence in me, and your lessons were phenomenal. I could actually feel the growth after each lesson. It was such a high, I forgot about everything. Chess changed my life." One could write a book consisting only of such testimonials. While chess needs no gimmicks to be enjoyed, there are times when a boost is needed. Ashley offers 25 ways to make chess fun ranging from chess theme parties to all types of chess variants. Another section briefly discusses ways to keep girls involved. There is a long-held notion that girls do not excel in chess because of some predisposition. Ashley has able to interview a number of master-level female players who provide interesting perspectives of chess life in a male-dominated domain. In the last part of the book, Ashley has a section addressing frequently-asked questions (FAQs) of parents and educators. As in his introduction, he destroys a number of myths about chess and offers sensible advice to help adults create a suitable environment for a budding chess player. Of course, he includes the rules of chess. While these rules lack the details needed for learning (get his CD-ROM), he provides a glossary of terms as well as a book list. So the immortal question remains, "What is Maurice Ashley up to?" One can almost guarantee that he's in a great mood these days. Given Ashley's long list of chess accomplishments, the autobiographical section gives us yet another view of the Grandmaster from the "Black Bear School of Chess." While Maurice Ashley never saw the golden streets he envisioned as a child, the Brooklyn streets on which he trod would lead him to untold treasures that he could never have imagined. This book is such a treasure. Ashley, Maurice. 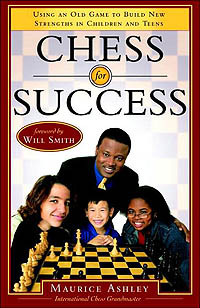 Chess for Success: Using an Old Game to Build New Strengths in Children and Teens (paperback), New York: Broadway, 2005, 269; foreword by Will Smith. Prices: US$14.00/Cdn$21.00. Order online at Random House Books !